Brunch | All of This! 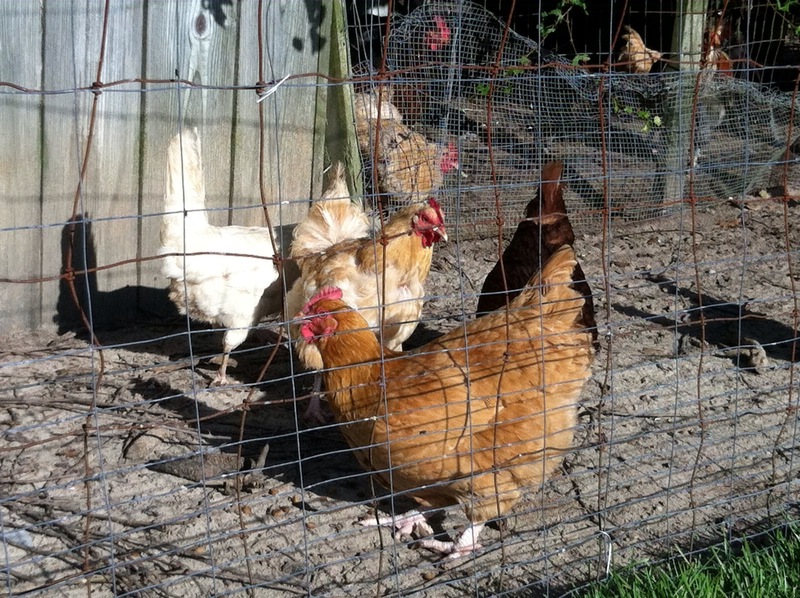 We are fortunate to have our own chickens here on Misty Morning Farm. Farmer Paul, aka husband, calls them the Getty Girls. Did you ever see the animated film Chicken Run? It’s delightful and mindless entertainment for a rainy Sunday afternoon. Chicken house antics. When Farmer Paul talks about his Getty Girls, thanks to that film, I envision our southern hens, pecking and scratching, all the while accessorizing their beautiful coats of feathers with strands of pearls around their necks. Can’t you see it? 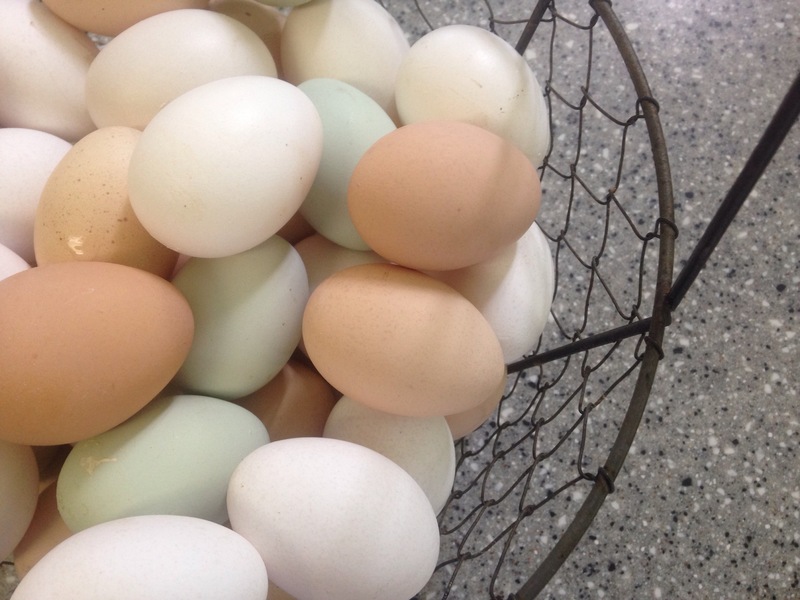 Our girls are refined hens, producing the most beautiful colorful eggs that can easily rival those imaginary strands of pearls that grace their feathery necks. If you have access to farm fresh eggs, make the effort to find and purchase them. It’s worth it. The yolks are a rich deep golden color, and the taste is so much better. They require no refrigeration, and my recipes are much more flavorful when fresh eggs are used. I have included a tried and true recipe with a new twist. I love breakfast for breakfast, brunch or supper, and Eggs Benedict top my preferred list. Use your favorite recipe or mine below, but replace the Canadian bacon or ham with avocado and tomato. It is so rich and creamy! I think you’ll like the change. 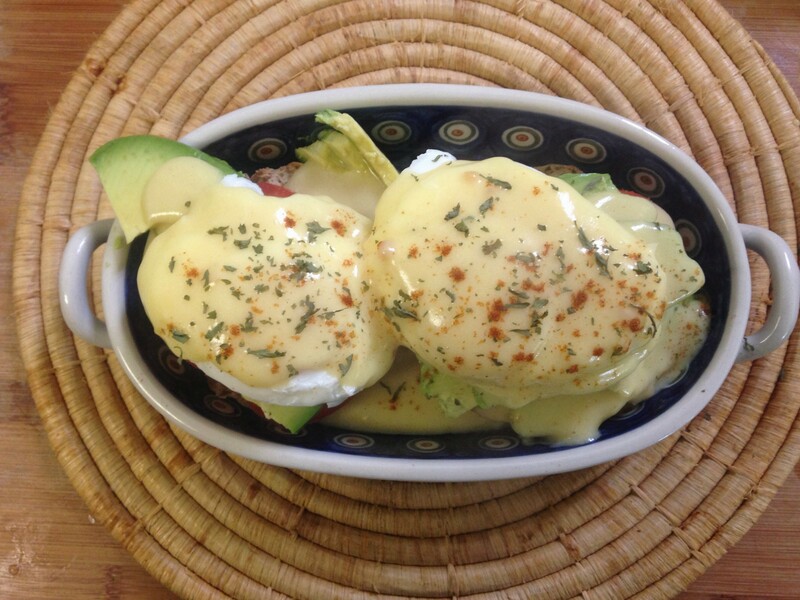 Make Easy Hollandaise Sauce. To poach eggs, fill a large saucepan with water and bring to a boil. Add the white vinegar and reduce heat to a simmer. Crack and gently drop in the eggs. Simmer for 3 to 5 minutes. Remove when the whites are firm and the yolks are done to your taste. Arrange in layers on each of the toasted muffins, the cheese, sliced tomatoes and sliced avocados. Top with the poached eggs and Hollandaise and garnish with paprika and parsley. P.S. If you’re in a hurry Knorr makes a pretty good sauce mix…but, as always, fresh is best. Combine egg yolks and lemon juice in a food processor. Turn it on and slowly add the melted butter. The sauce will emulsify. Add the seasonings. Do not reheat or sauce will separate. 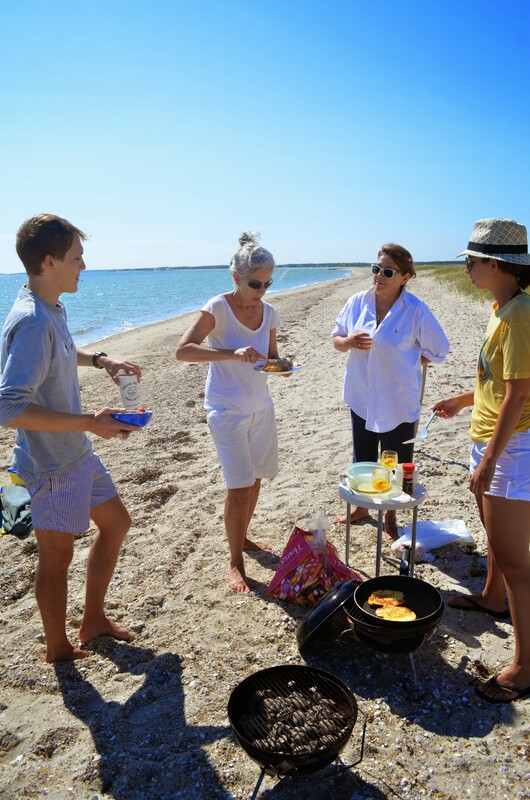 This past summer on the Vineyard, I was fortunate to be invited to a couple of breakfasts on the beach. 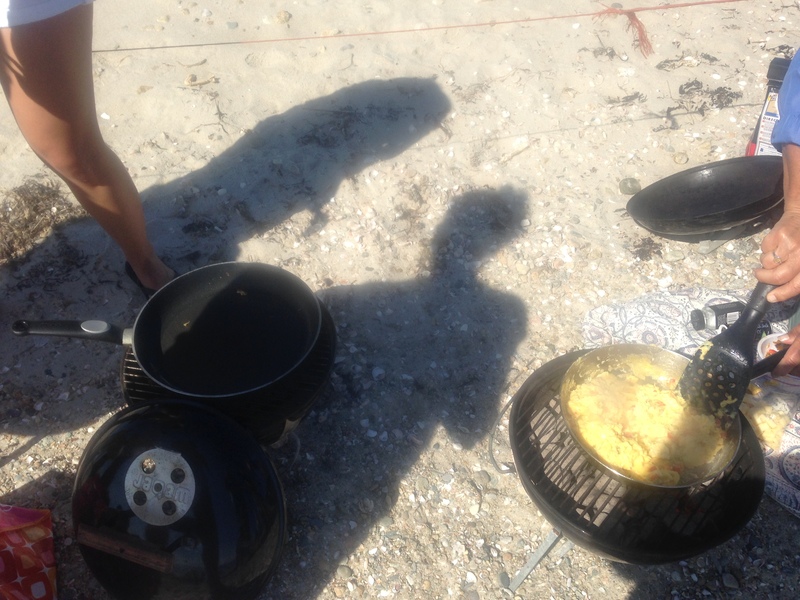 Each featured delightful and delectable offerings of food and fellowship. French toast and scrambled eggs cooked on grills, fresh fruit and freshly, baked that morning, scones, tomato pies, potatoes cooked various ways and artichoke strata are just a few of the samplings offered on those sun drenched mornings.With the aroma of freshly brewed coffee, grills being fired up and the sweet, salty air surrounding us, I would say this was a near perfect way to begin a day. The perk to all of the above was having your beach chair already set up, your suntan lotion handily available, and the sun and surf ready to be enjoyed. The breakfast easily eases into afternoon. This is another All of This! 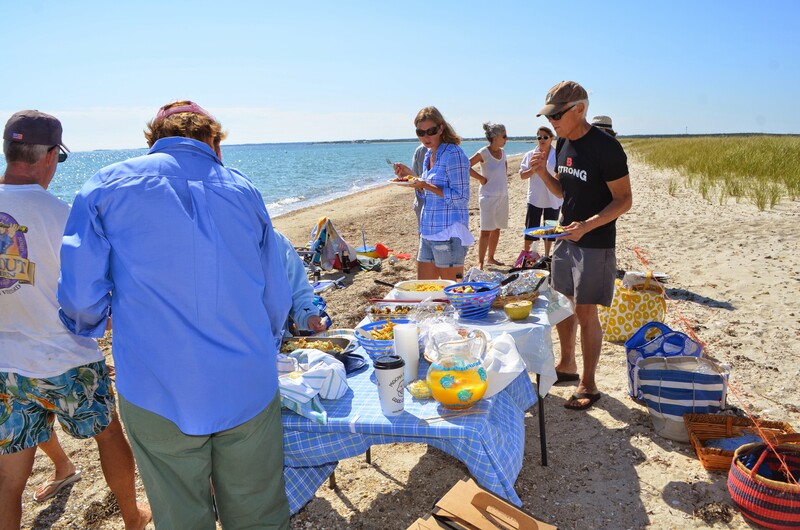 moments with friends gathered around in chairs, our tables being our laps or towels, and nature providing the most beautiful entertainment venue possible. 1. Heat a large nonstick skillet over medium heat. Add olive oil to pan; swirl to coat. Add shallots, and cook for 2 minutes, stirring frequently. Stir in artichoke hearts, tomatoes and garlic; cook for 8 minutes or until artichoke hearts begin to brown, stirring occasionally. Remove from heat, and stir in herbes de Provence. Cool 10 minutes. 2. Combine milk, black pepper, salt, and eggs in a large bowl, stirring with a whisk. Add Parmigiano-Reggiano cheese and bread; toss gently to combine. Stir in artichoke mixture, and let stand for 20 minutes. 4. 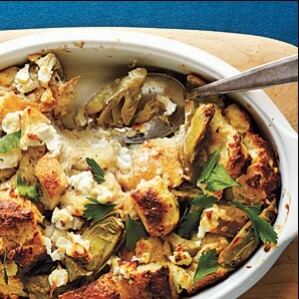 Spoon half of bread mixture into an 8-inch square glass or ceramic baking dish coated with cooking spray. Sprinkle with half of goat cheese, and top with remaining bread mixture. Sprinkle remaining half of goat cheese over top. Bake at 375° for 50 minutes or until browned and bubbly.